In this instance. 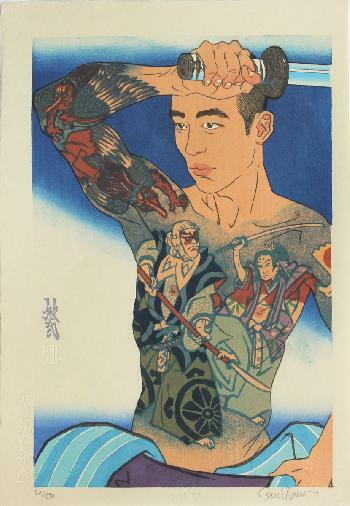 Paul Binnie has re-imagined the top half of an Utagawa print (omitting the legs), showing a tattoo that is loosely based on a painting by Torii Kotondo. The tattoo is evidence of Paul Binnie’s continued involvement with such motifs in his work. Fine impression, colours and condition. The title in blindprinting in the bottom left margin.